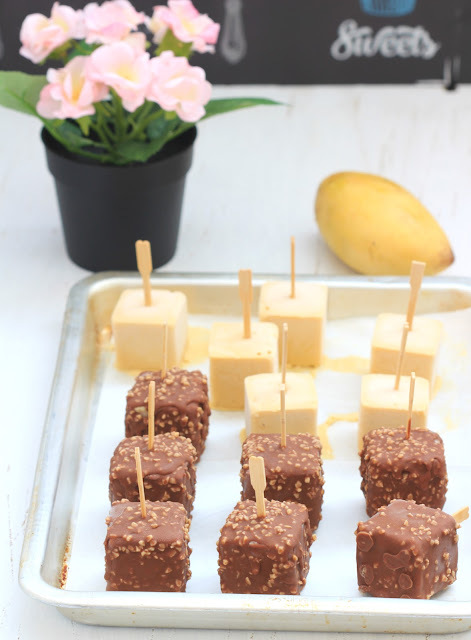 my bare cupboard: Mango-chocolate ice cream popsicles "
I made these ice cream pops few days ago as part of my freezer clean up drive heh! I've got loads of frozen fruits and purée stash so what better way to use one of them than making ice cream. This is a custard-based ice cream; milk, cream, sugar and egg yolks are cooked together until thickens. There's a bit of ice crystals in the ice cream though and not as smooth as most of the homemade ones I've made before. Not sure if it's the liquid content of the mango purée or I didn't churn the mixture long enough. Maybe a Philadelphia-style ice cream is more suited when it comes to fruity ice cream. That said, this is one delicious ice cream, according to my un-sophisticated palate, rich, almost creamy yet taste very refreshing and the calamansi juice adds a wonderful flavour contrast! The mango-calamansi ice cream is fantastic on its own but the chocolate-almond glaze not only adds a visual appeal , the taste compliments the ice cream really well! For the mould, I used a Silikomart small cubes mould (15 cavity). Ice cream recipe below will fill up 14 cubes. You can, of course, use any freezer-proof mould or container of your choice. * Combine milk, cream and sugar in a small saucepan and bring to a boil. * Meanwhile, beat yolks and the (2nd) sugar until light and creamy. * Gradually pour warm milk into the yolk mixture whisking as you pour to prevent curdling. Pour milk-egg mixture back into the saucepan and cook over low heat, stirring constantly for 20 minutes or until mixture thickens. * Transfer custard into a heat-proof bowl and place it over an ice water bath. Let mixture cool completely, stirring from time to time. * Stir in mango puree and calamansi juice into the cool custard. Refrigerate for 6 hours or overnight. * Churn mixture in an ice cream machine for 20-30 minutes. Spoon ice cream into the silicone mould and cover top with plastic wrap. 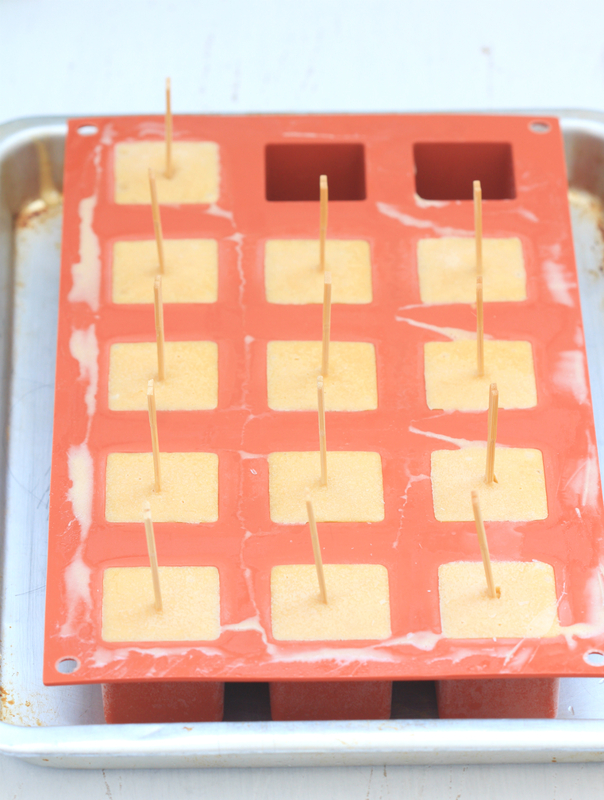 Freeze until almost firm then shove a flat bamboo skewer stick halfway into each cube. Freeze overnight. * Un-mould mango ice cream cubes and place into a parchment-lined baking sheet. Freeze for 1 hour. * Melt chocolates over a pan of barely simmering water, stirring from time to time. 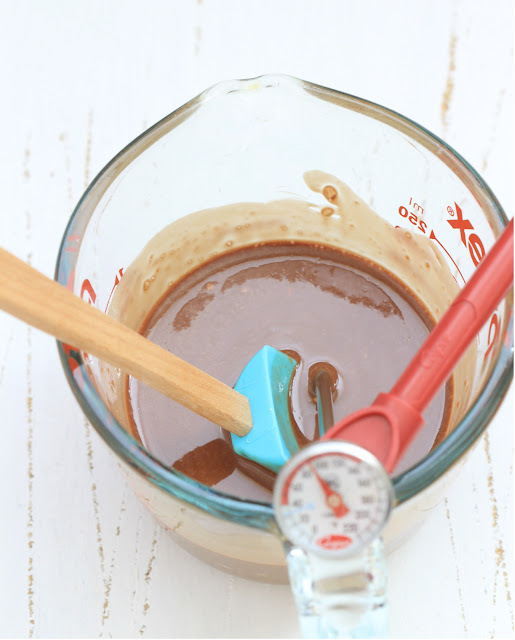 Once melted, add in the cocoa butter powder and mix until smooth. Transfer into a small jug/bottle and stir in the almond, let cool to 90ºF before using. 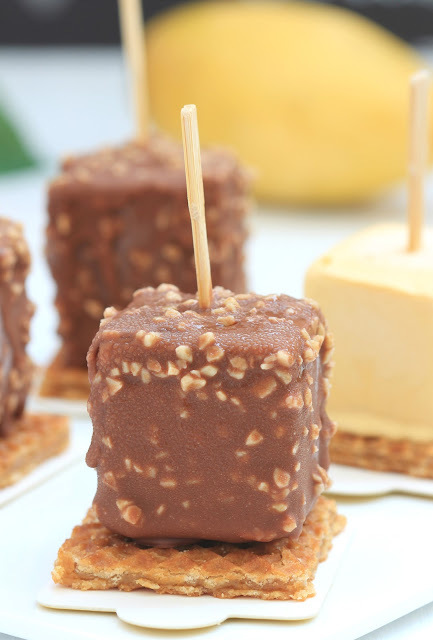 * Take out ice cream cubes from the freezer and working quickly, dip popsicles into the chocolate glaze one by one. 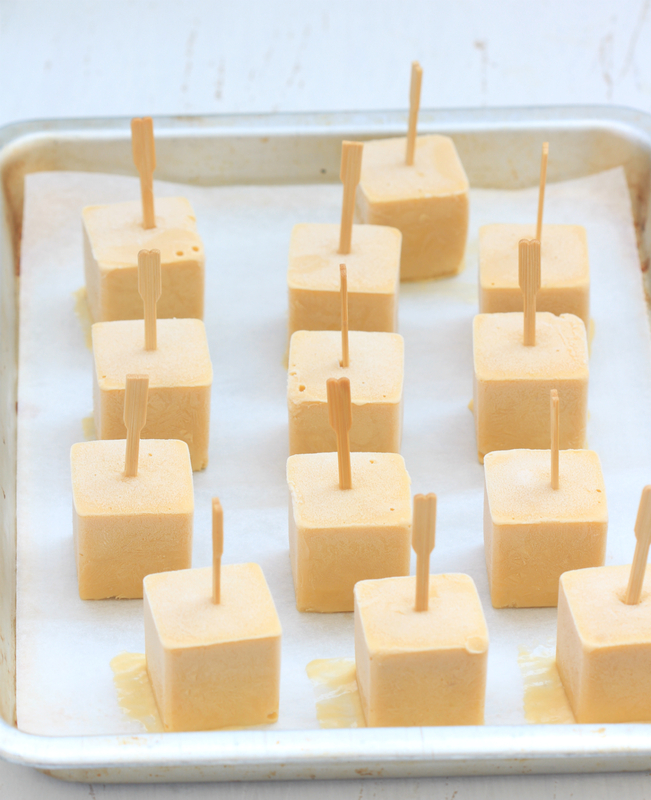 Place glazed ice cream cubes back into the baking sheet. * Return the glazed ice cream into the freezer and freeze for another 1 hour before serving. * Eat as much as you can! 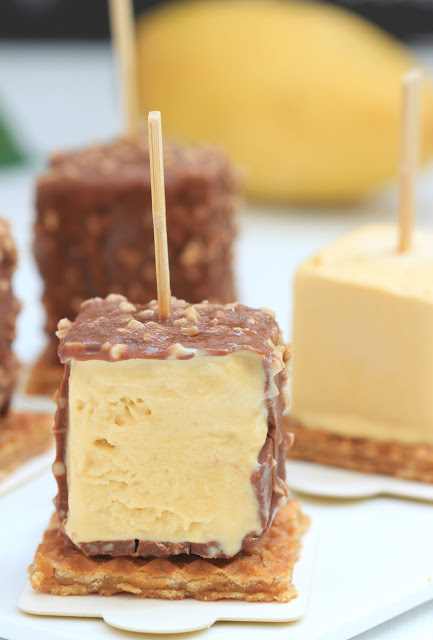 You are a dessert queen :-) These ice pops look wonderful! Is there replacement for egg yolk? What other methods to make this ice cream if don't hv ice cream maker?